This is why facebook is the devil. A day doesn’t go by where I don’t desire cheese. Frankly, my banana bread was a bit stale. Which is a feat in itself because that means we didn’t eat an entire loaf in 34 seconds. Why aren’t loaf pans made much larger? Like, instead of 9×5 inches, it should probably be 2×4 feet. THEN no one would have the problem of eating the entire loaf of banana bread the same day it’s made. Anyhoo. Even I thought that banana bread grilled cheese was a bit out there. I asked on facebook & twitter if I should do such a horrid thing. And you thought that I should. I relish in the fact that you are weird too. We SO like all the same things. I’m such a grilled cheese freak. Grill all the bread, all the cheese. I want it 24/7. I’m even teaching a class on it in two weeks! Um, also, how cute are my metallic rose goldy mugs? My friend Laura sent me one of them and I, of course, had to buy one from Starbucks during the holiday season and they pretty much make my day. Pretty things. Life is so much better when things are pretty. Since banana bread is soft yet dense, the entire slice doesn’t crisp up like regular crusty bread. You need a thick slice, after all, for this to work. You can make the sandwich like a regular old grilled cheese OR you can butter both sides, fry both sides, then stick the cheese and chocolate in the middle and keep it over low heat until the insides melt. The insides melt. Now that sounds delicious. Hmmpf. 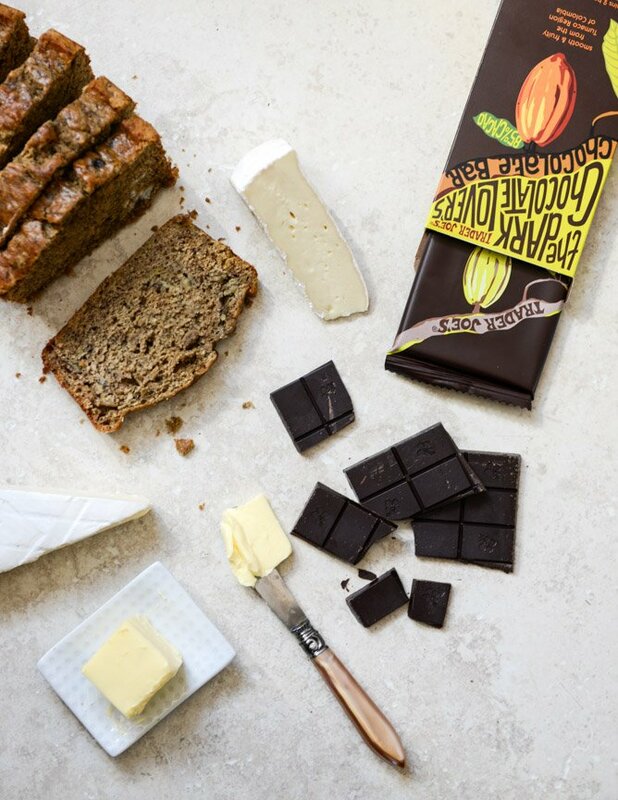 4 slices banana bread, if it’s slightly stale, even better! Heat a large skillet or griddle over medium heat. Butter the outsides of the banana bread, and place one slice butter-side down in the skillet. Immediately top the slice with some cheese, a bit of chocolate, and a little more cheese. I like to always have cheese on both sides to act like “glue” – it helps hold the sandwich together when flipping. Cook until both sides are golden and the cheese and chocolate is barely melted, about 4 minutes per side. If the cheese is melting slowly, I like to reduce the heat to medium-low and cover the skillet – just make sure to watch the sandwich because the sides cook more quickly. This is so wrong, oh my, then why does it look so good, no actually I mean amazing. You are crazy but in a good way. I’m on this. Oh my, Oh my! I am lost for words! I must have this now! I.. I just.. There’s nothing to say. Speechless. Just. Speechless. Holy crap. MIND BLOWN. Can’t wait to try this. It looks incredible, Jessica! Pingback: foodie finds - Live. Laugh. Cook. WOW this is simply amazing! 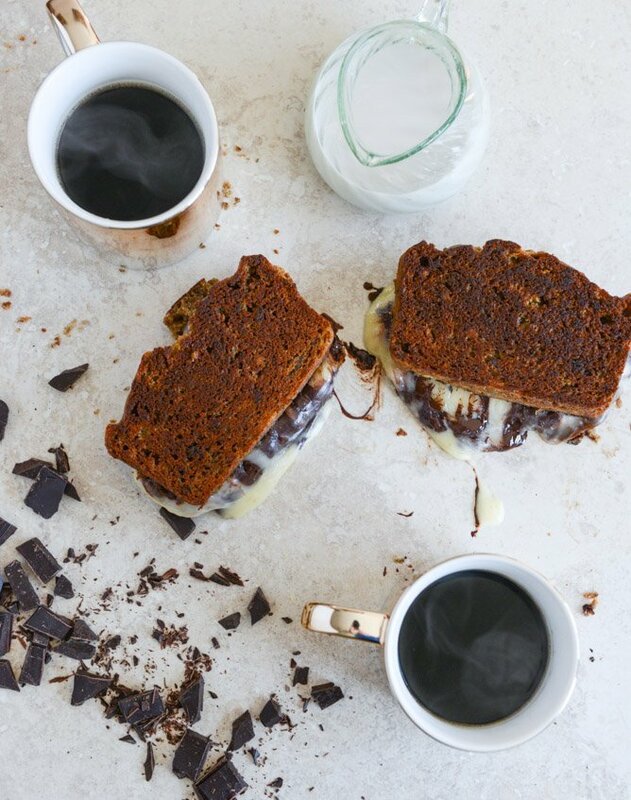 I love that you did a dessert grilled cheese! YUM! This looks so wrong and yet so AWESOME! Another suggestion for the next time you have “stale” banana bread or cinnamon rolls – slice them up and turn them into french toast!! I know, right?!? The cinnamon rolls you’ll want to turn on their side to slice so you get that wonderful swirl of gooey goodness, dip in egg/cinnamon/sugar/cream blend and fry away! We love our french toast!! This is completely unbelievable and I love every piece. This counts as dinner, right?